Fufa officials brief the media on Uganda Cranes new technical team. FOOTBALL–Federation of Uganda Football Association has appointed Moses Basena and Fred Kajoba to step into Milutin Micho Sredojevic’s shoes and oversee national team Uganda Cranes. Basena and Kajoba, who have been serving as assistants to Micho, will take the role in the interim, said Fufa president Moses Magogo. 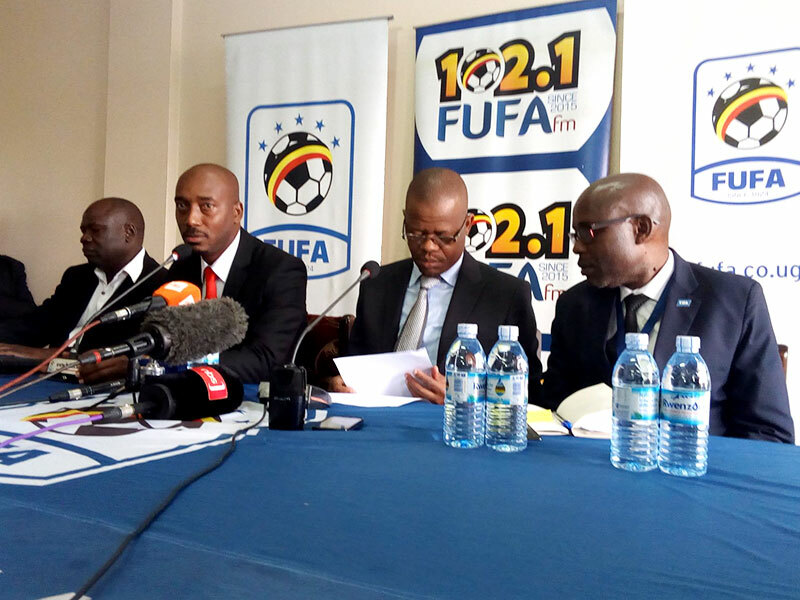 Addressing the media at Fufa House in Mengo on Monday, Magogo said the two will oversee the Cranes until after the forthcoming World Cup qualification double header against Egypy and CHAN qualifier against Rwanda. “Moses Basena and Fred Kajjoba will take on the mantle as interim coaches for the National Team,the Uganda Cranes. Moses Basena and Fred Kajjoba will handle the team up to the return leg against Egypt,” Magogo said. “For now we are not receiving applications,” he added. Uganda faces Egypt in Africa World Cup qualifier Group E with their hope of booking a historic ticket to Moscow for the 2018 summer football extravaganza still in their own hands. The first leg will be played at Mandela National Stadium Namboole on August 31, before the return leg six days later at Port Alexandria. Egypt top the group after two wins in two with Uganda second with four points. However, it is the Cranes with a better chance going into round three of the fixtures having held Ghana to a draw in Accra, a place Egypt will have to visit later despite beating the Black Stars in Cairo in their opening game. Republic of Congo completes the group. “The outstanding amount that we owe Micho is $54,000.There is a system challenge that we must address as a nation. National teams are paid by governments not federations,” Magogo said. “When the coach expressed desire to part ways with us we sat with him and offered to pay double his pay in a bid to keep him but he rejected it,” Magogo added. Micho, who terminated his contract with Uganda and departed the country for South Africa last week, earlier cited unpaid wages worth $64000. The contract between the Serbian tactician and Fufa stated that the coach could terminate his contract after three months of unpaid salary. Magogo said Fufa will clear Micho’s arrears in due course as agreed upon in their meeting. Basena has previously coached Sports Club Villa, KCCA FC, URA FC, Makerere University team, Kira Young and The Saints, and across the borders, Tanzania giants Simba SC.